The magical adventures of an eccentric Mary Poppins-esque heroine and her flying feline charges, sure to charm readers big and small. The first book for children by an internationally acclaimed novelist and poet. She is an expert at baking and eating fancy iced cakes, and her favorite mode of travel is par avion. On windy days, she takes her sixteen cats out for an airing: Minky, Misty, Taffy, Purrsia, Pirate, Mustard, Moutarde, Hemdela, Earring, Grigorovitch, Clasby, Captain Captain, Captain Catkin, Captain Cothespin, Your Shyness and Sizzles. With the aid of her favorite tea party tablecloth as a makeshift balloon, Miss Petitfour and her charges fly over her village, having many little adventures along the way. 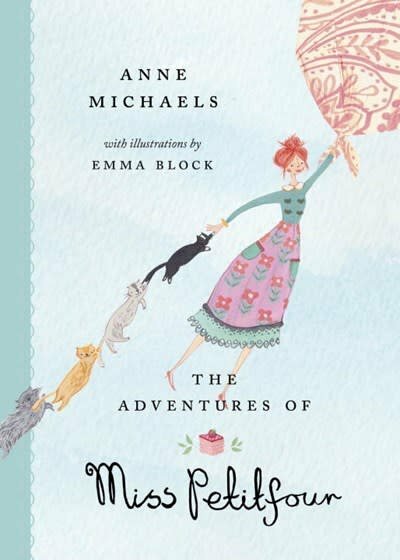 Join Miss Petitfour and her equally eccentric felines on five magical outings—a search for marmalade, to a spring jumble sale, on a quest for “birthday cheddar”, the retrieval of a lost rare stamp and as they compete in the village’s annual Festooning Festival. A whimsical, beautifully illustrated collection of tales that celebrates language, storytelling and small pleasures, especially the edible kind!